I saw this and wondered if it could be true. 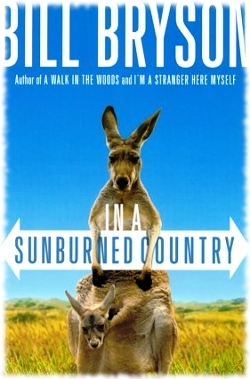 I’m reading a travel book about Australia right now called In A Sunburned Country by Bill Bryson, and am most of the way through it but haven’t seen anything about this. Emus and kangaroos not being able to walk backwards seems like the quirky kind of thing that Bill Bryson would put into a travel book but… maybe I haven’t quite gotten to that part yet or something. Okay so where were we? 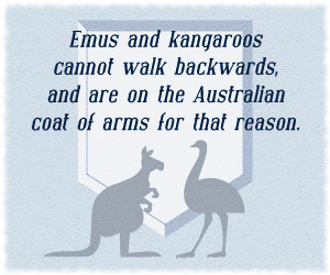 Oh yeah, could it really be true that the emu and kangaroo are on the Australian coat of arms because they can’t walk backwards? And are they even on the coat of arms at all? 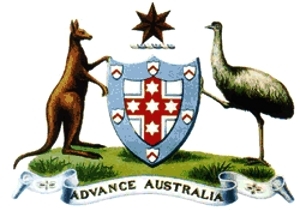 Turns out that yes there is an emu and a kangaroo on the Australian coat of arms , a kangaroo on the left and an emu on the right and both of them are holding up the shield. According to Wikipedia the red kangaroo and the emu are both ‘unofficial emblems of the nation’ because they’re the most well-known animals that are native to Australia and Australia only. I do have bad news though, both the emu and kangaroo can move backwards. Okay maybe that’s not bad news for emu and kangaroos lol but yes they can move backwards. It’s just that they don’t walk backwards very often so apparently it’s become a commonly held belief that they can’t walk backwards because of that. So there you have it: emus and kangaroos can move backwards, forwards, sideways, and apparently also hold up shields.